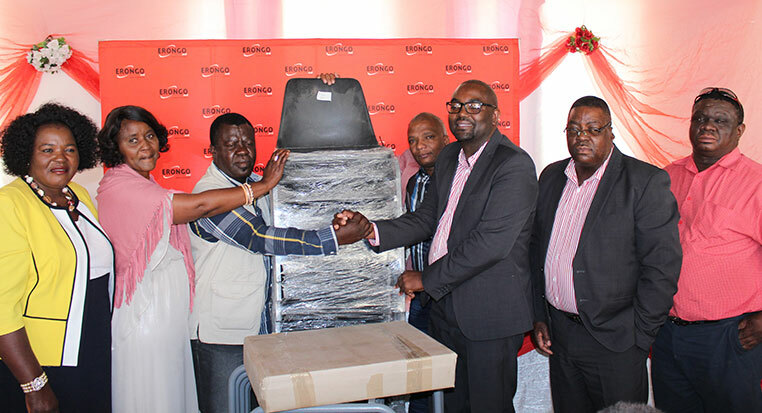 On Tuesday 18 June 2017, Erongo RED through its Corporate Social Responsibility Committee handed over 260 chairs and desks to the tune of N$170 000 towards the Da Palm Senior Secondary School in Otjimbingwe. Speaking at the official handing over ceremony Erongo RED’s Chief Executive Officer, Mr. Fessor Mbango said that the donation should not merely be seen as a gesture of assistance and social responsibility on the part of Erongo RED, but as a much needed support towards the Da Palm Senior Secondary School and by extension the community of Otjimbingwe. “Education is the ultimate key to crafting successful leaders of tomorrow, thus it is pivotal to start investing in them now and not tomorrow” Mbango said. Accepting the donation on behalf of the school was the Chairperson of the School Board, Mr. Tsamaseb and the School’s Principal, Ms. Jeomba who both expressed their immense gratitude towards Erongo RED for their generous gesture. “I will assure you that Da Palm Senior Secondary School will continue to produce good results. I will also assure you that the furniture you have donated today will be well taken of for the future generations to come”, Ms. Jeomba said. The Constituency Councillor, Hon. Ndjago, The School Principal, Ms. Jeomba, The School Board Chairperson, Mr. Tsamaseb Erongo RED’s CEO, Mr. Fessor Mbango, Erongo RED Board of Director, Mr. Wetha, Erongo RED CSR Committee Chairperson, Mr. Daniel Kuzatjike, Erongo RED Area Superintendent, Mr. Steve Araeb.